Fun Halloween Poems! Please leave me a comment! Read poems to your kids for fun and in anticipation for Halloween! Talk about the poem “Sharing Candy” and what the difference is between being selfish and sharing with friends. It’s a great opportunity to teach the value of sharing. 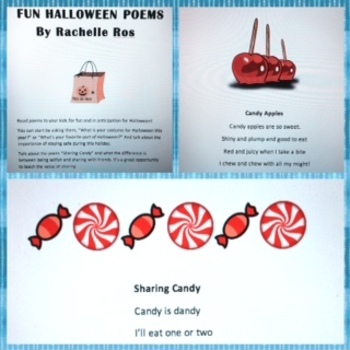 =) Four poems for kids to enjoy and recite together on days leading up to Halloween.